I was lucky enough to spend a whole week of Winter school holidays in Melbourne, visiting a friend lucky enough to know me for 36 years. We ushered 5 children under 11 to St Kilda for a wee adventure and the promise of gelato too. There is a beach and a jetty, and you can probably see Tasmania on a clear day (no, not really). The small folk very quickly tossed their shoes aside and took turns burying each other up to their necks. This friend of mine is not a fan of the beach, she doesn’t like sand getting in everywhere and everything. She was quietly having conniptions thinking of washing clothes x 5 kids and 1 adult, because I was right alongside them in the sandy department. I managed to distract her with shiny things. These shiny things. We collected a beanie-ful, about 2 kgs of this goodness, sparkling in the sun along the shoreline. Two things I found out about St Kilda: 1.people drink lots of beer and wine, AND 2.they don’t use rubbish or recycling bins very often, on or off shore. Thank you irresponsible people! 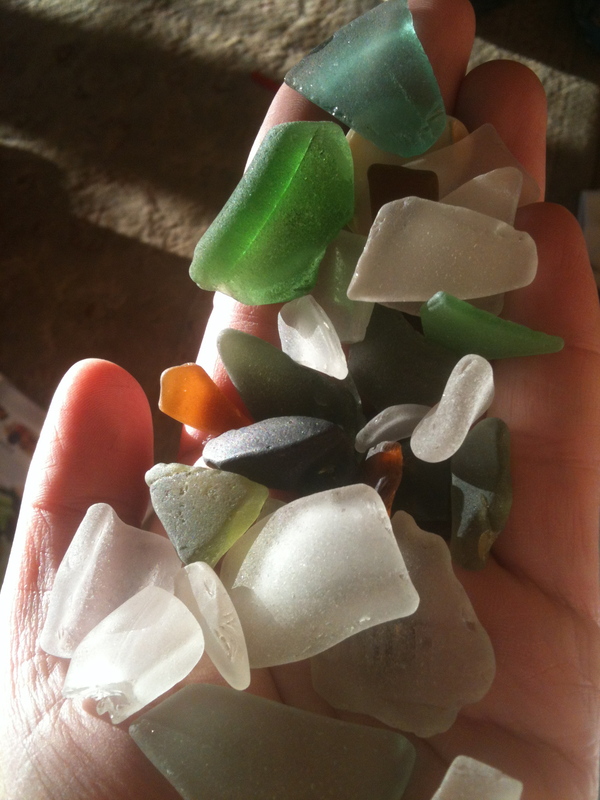 I love Sea Glass.